I blame the pesto. Yes, we are growing basil again this year, and no, I am not making pesto. Too busy. But my husband loves pesto, which you may have inferred if you read last summer’s post about making pesto. Perhaps, in a moment of longing (and delirium) about the absence of pesto, he went to our local warehouse club, i.e. to Costco, and bought a tub of it. Now we have mucho pesto. It has been hogging up space in the fridge, and I have been glaring at it. He keeps saying that “we” should freeze it, which means that it is still hanging out in the fridge, all smug and chill and enormous. But I was inspired the other day and bought some ricotta cheese to mellow out the pesto, which seemed a little intense for a toddler. Our little girl eats a lot of pasta, and consequently, we eat a lot of pasta too. I made the following dish and it has been a huge success at our house. So huge that I have made it three times in the last six weeks. One pound of pasta that you like. One-half pound of ricotta cheese. A few handfuls of fresh baby spinach. About a cup of pesto. A little garlic. Salt. A generous amount of olive oil. Add oil to the pan. Sauté one clove of minced garlic, add ricotta cheese and season with salt and pepper. Add pesto, cooked pasta and the fresh spinach. Stir to combine and check seasoning. Done in 30 minutes or less. Shown below with sauteed zucchini. 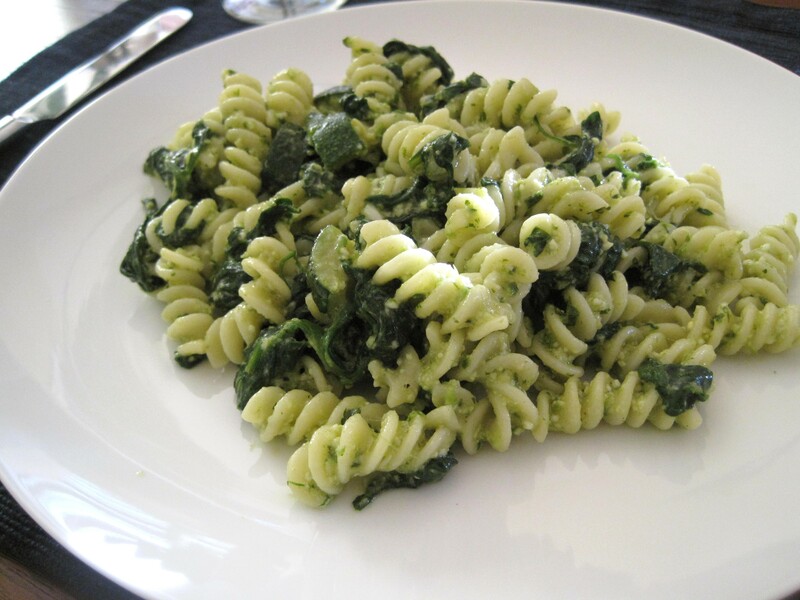 This entry was posted in Basil, Pasta, Uncategorized and tagged Pasta, Pesto, Ricotta Cheese, Spinach. Bookmark the permalink.